The kids of My Voice, My Life. The Skinny: Inspirational documentary from Oscar-winning filmmaker Ruby Yang about disadvantaged Hong Kong teens performing in a musical. My Voice, My Life is not challenging or accomplished, but the uplifting material and sincere emotions make this an easy success. by Kozo: Directed by Oscar-winning documentary filmmaker Ruby Yang, My Voice, My Life is an inspirational look at disadvantaged kids finding new hope through a charity musical performance. 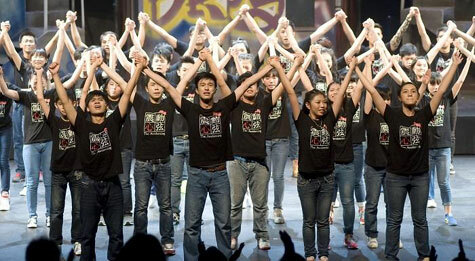 In 2013, eighty students from four lower-ranked secondary schools, including a school devoted to sight-impaired students, auditioned for and were selected to perform in the musical The Awakening. The performance itself was sponsored by the L plus H Creations Foundation and the Lee Hysan Foundation with both organizations having a hand in hiring Ruby Yang and providing additional students to act as her documentary film crew. There were clear charitable efforts involved in the making of this documentary. There was also a clear lack of critical distance, making this lauded work (major Hong Kong film names, including Johnnie To and Ann Hui, offered quotes as promotional support) akin to a glorified “making of” documentary. Not that there’s anything wrong with that – we should just be aware of what we’re watching. My Voice, My Life is basically a promotional video for a charitable cause, so it would be reasonable to look at the film’s inclusions and omissions with a critical eye. Despite being about a group of students, the film concentrates on a select few, who possess either poignant or “edgy” stories, like bad boy Ah Bok, who’s chosen for the musical despite running with the wrong crowd on his downtime. Minor drama occurs when Ah Bok gets in trouble for repeatedly smoking on school grounds – will he clean up his act and join the other kids in wholeheartedly performing the musical? Spoiler (such that it is), but Ah Bok gets with the program easily. His improvement is great, but it does make one wonder about the rest of the eighty participating students. Did anyone else have issues, and is Ah Bok’s uplifting story really the only disciplinary problem encountered? Or was this one simply selected to fit the narrative? Sorry for the cynicism, but when an agenda is this obvious, one should expect a few raised eyebrows. Documentaries don’t always tell the whole truth – this is just a reality of the genre.